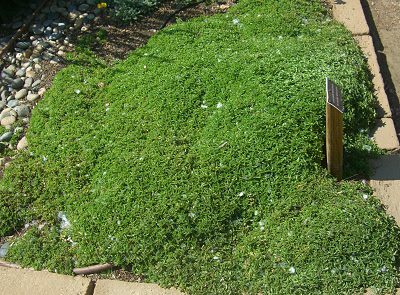 Originally introduced by Oregano lover Betty Rollins, Mounding Marjoram (or Betty Rollins Oregano) with its minty fragrance and ability to hug the ground is one of our favorite ground covers. Mounding marjorma does flower and will put up two to three inch tall reddish purple flower heads in summer. If the flowers get too tall for the look you want, just mow them to about two inches above the ground and the plant will come back tighter and flatter to the ground. We find them the perfect height the way they naturally grow and love their color. 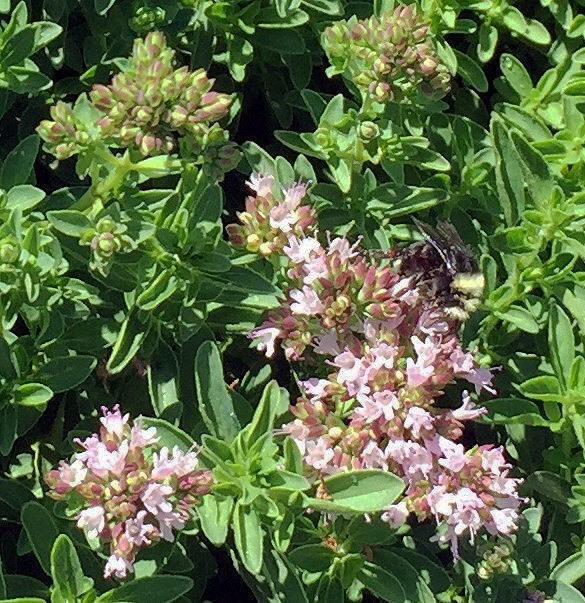 The bees love them too! Can you find the bee on the photo to the left? Mounding Marjoram is often included in our 36 Pack Alternative Lawn Assortments. This plant is often available in plug trays. These trays hold 128 of all the same plant. They are a great low cost way to fill a lot of space. Each cell is 3/4 of inch by an inch. Check here to see if Mounding Marjoram Plug Trays are available.